The audacious new adventure of the At Risk team from America's #1 bestselling crime writer. 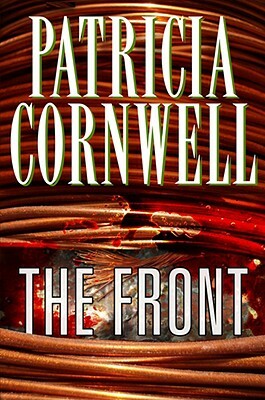 When Patricia Cornwell introduced the quicksilver, cut-to-the-bone style and extraordinary cast of characters of At Risk, the result was electrifying: "At Risk is Cornwell's finest novel. It works in every way possible-- fascinating characters, solid plot, great pacing and expertly crafted prose" (St. Louis Post-Dispatch); "Absolutely the best. Here's hoping we'll see more of Win, Monique, Nana and Sykes in the coming years. They are the best characters to emerge from Cornwell's creative pen since . . . well, Kay Scarpetta" (The Denver Post). At Risk featured Massachusetts state investigator Win Garano, a shrewd man of mixed-race background and a notinconsiderable chip on his shoulder; District Attorney Monique Lamont, a hard-charging woman with powerful ambitions and a troubling willingness to cut corners; and Garano's grandmother, who has certain unpredictable talents that you ignore at your peril. And in The Front, peril is what comes to them all. D.A. Lamont has a special job for Garano. As part of a new public relations campaign about the dangers of declining neighborhoods, she's sending him to Watertown to "come up with a drama," and she thinks she knows just the case that will serve. Garano is very skeptical, because he knows that Watertown is also the home base for a loose association of municipal police departments called the FRONT, set up in order that they don't have to be so dependent on the state--much to Lamont's anger. He senses a much deeper agenda here--but he has no idea just how deep it goes. In the days that follow, he'll find that Lamont's task, and the places it leads him, will resemble a house of mirrors--everywhere he turns, he's not quite sure if what he's seeing is true. "Falsehoods rule," warns his grandmother. And they can also kill. This is the master writing at the absolute top of her game. You will never guess what lies behind The Front.